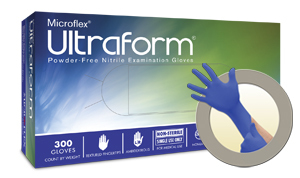 Microflex UltraForm Powder Free Nitrile Exam Grade Gloves offer a unique supple feel that conforms to your hand and truly "fits like a glove!" In field tests, users that wore Ultraform nitrile disposable gloves actually experienced an increase in fine motor task performance compared to their bare hands. You have to feel how this feels. An independent survey revealed that the fit of these certified ergonomic UltraForm exam gloves are preferred 99% of the time versus the users current gloves.